A closer look at the wider significance of a new agreement between the two sides reached this week. 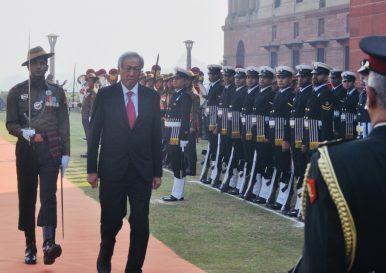 From November 27 to 29, Singapore’s Defense Minister Ng Eng Hen paid a visit to India for a series of engagements, including the second iteration of their new defense ministers’ dialogue mechanism. One of the outcomes of his visit this week was the conclusion of a new naval pact between the both sides which boosted their maritime security cooperation. As I noted earlier this week, India and Singapore are already close bilateral and regional partners and their defense relationship has been gradually growing over the past few years, with the inking of the Defense Cooperation Agreement (DCA) in November 2015 and the convening of the first Singapore-India Defense Ministers’ Dialogue (DMD) in June 2016. Ng’s trip to India this week was expected to see a boost to defense ties ahead of an active year for both sides in 2018, with Singapore holding the annually rotating chairmanship of ASEAN and India hosting all ASEAN ministers for a special meeting in New Delhi and Modi delivering a keynote speech at the Shangri-La Dialogue (SLD), Asia’s premier security forum, in June (See: “Ng Visit Highlights India-Singapore Defense Ties”). One of the anticipated outcomes of the trip, as Ng previewed in his address at Brookings India the previous day, was the conclusion of the India-Singapore Bilateral Agreement for Navy Cooperation. As expected, the pact exchange was witnessed by Ng and his Indian counterpart Nirmala Sitharaman as part of their interactions. The pact holds significance for both the wider relationship as well as the naval realm in particular. In terms of broader defense ties, this completes the agreements between the two sides in all service arms – the Air Force Bilateral Agreement was in place in 2007 and renewed on the sidelines of the 11th Singapore-India Defense Policy Dialogue in January this year, while the Army Bilateral Agreement was also already in place in 2008 and is expected to be renewed next year. That is not an insignificant development. As both sides have noted, with the conclusion of the naval pact, the SAF is at this time the only military to have bilateral agreements with India for all of its service arms, an indicator of both the trajectory of defense ties as well as their growing breadth and depth relatively speaking. It also deepens ties in the maritime realm more specifically. The agreement covers several areas including increased cooperation in maritime security, joint exercises, temporary deployments in each other’s naval facilities, and mutual logistics support. How exactly this will be operationalized and affects tangible maritime security ties remains to be seen. An overwhelming focus of the media commentary following the pact’s signing was on the narrow issue of the Indian Navy’s greater access to Changi Naval base, and Ng said himself at a joint press conference that Singapore would welcome this. Yet the real gains could come not just in incremental boosts to elements of existing defense cooperation, but wider strategic collaboration between the two sides and in the broader ASEAN context. Bilaterally, the wider scope for naval cooperation the pact affords could further boost engagements between the two sides, including more complex exercises in bodies of water, be it be closer to Singapore in the Straits of Malacca or closer to India in the Andaman Sea. It could also further India’s efforts to interact more with Southeast Asian states in the maritime security domain. New Delhi is one of a growing number of ASEAN dialogue partners wanting to increase the scope and complexity of their exercises with Southeast Asian states, and Singapore is in a position to help facilitate that as ASEAN chair next year when it is also expected to see both China and the United States hold drills with ASEAN as well (See: “What Did the ASEAN Defense Meetings in the Philippines Achieve?”). Indeed, it is the city-state’s own interest to do so since New Delhi shares a commitment to freedom of navigation and overflight and helps provide a wider balance in the region beyond Washington and Beijing. Both sides will likely announce more concrete steps in 2018, with an active year expected in both ASEAN-India relations as well as in Singapore-India relations. This includes the commemoration of the 25th anniversary of the Singapore-India Maritime Bilateral Exercise (SIMBEX), which, since it started in 1994, has gradually grown in scope and complexity, beginning with an emphasis on anti-submarine warfare but then also including elements like maritime security and anti-air and anti-surface warfare. That will make this space one worth watching in the coming months. The two sides completed the latest iteration of their exercise amid a particularly active few weeks for defense ties.